Updated 1:49 p.m. | Posted 12:54 p.m.
Anglers on Lake Mille Lacs will be able to keep some walleye during this year's open-water fishing season — a significant change after several seasons of a catch-and-release-only policy that frustrated anglers and local resorts around the iconic central Minnesota lake. The Department of Natural Resources announced the change Thursday but didn't provide details, saying it will announce Mille Lacs walleye regulations in mid-March for the season that starts May 11. "With some very conservative fishing regulations over the past three years, walleye are now at a level where we can cautiously allow anglers to start keeping some fish during the open-water season," DNR Commissioner Sarah Strommen said in a statement. 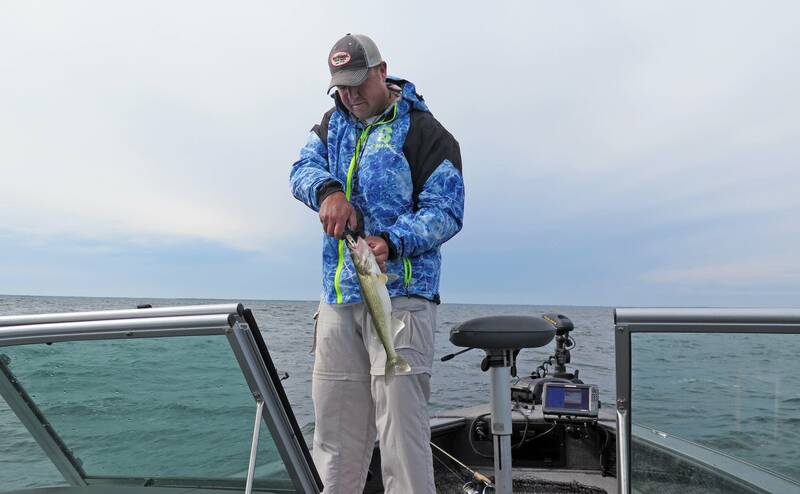 "The upward trend of the walleye population reflects the conservation efforts of both the state of Minnesota and the Ojibwe tribes with harvest rights in Mille Lacs Lake," added Mille Lacs Band DNR Commissioner Bradley Harrington. The DNR said the state and the bands recently agreed on a safe harvest level of 150,000 pounds of walleye, which provides a state allocation of 87,800 pounds. Under the catch-and-release only regulation last year, the walleye kill totaled just over 47,000 pounds. Mille Lacs' walleye population had fallen significantly in recent years, and officials have struggled to balance the demands of local businesses dependent on walleye fishing with the need to rebuild the fishery. In 2015, the state closed the open-water walleye season early. Officials then OK'd a winter season, but the warm weather put a damper on it. In 2016, the DNR went to catch-and-release only and also banned the use of live bait for those who planned to catch-and-release. The move triggered waves of anger. That August, Gov. Mark Dayton intervened to keep the season open after the DNR moved to close it earlier than anticipated. In 2017, the DNR not only closed Mille Lacs to walleye keepers, it stopped all walleye fishing for about a month in mid-summer, the peak of the season, to cut down on the hooking mortality of walleye who were caught and released but still didn't survive being caught. Last year's open water rules were essentially a continuation of 2017. The DNR's goal has been to try to open up some harvesting opportunities for anglers on the lake, but with caution, said Brad Parsons, the agency's fisheries chief. "Our intention is to provide as much walleye angling opportunity as possible," Parsons said Thursday. "We think at this point, given what our take was last year under similar circumstances, that we can provide for some limited open-water harvest." He also acknowledged that allowing keepers will bring more anglers. "That's the thing that gets tricky," he said. "We know there will be more people coming to the lake, which is great. But we don't know how many, so we don't know how that will affect (fishing) pressure."